Remember this Dream Home that HGTV gave away last year in South Carolina? It’s on the market for $2.395 million. You can see more photos and information about last year’s Dream Home in my post about it. Katie is selling her red-brick house in Antioch. I’d love to have a kitchen with a fireplace, so hers caught my eye. It opens to the family room on the other side. This lovely older home was built in 1850 and sits on nearly 5 acres. We have family in that area, so I might have to track it down next time I’m up there! The beach house from Something’s Gotta Give in the Hamptons recently sold — without ever hitting the MLS — for $41 million. The buyer of the 11-bedroom mansion was reportedly Jimmy Tisch, CEO of Loews Corporation, who purchased the property before we ever got a chance to peek inside. Darn it! Since the interiors in the movie were sets, I’d love to get a look at the real deal. Anderson Cooper's Houses: Which One Would You Buy? I enter on that dream home and I was upset I didn’t won it I know went some one win they will sale it I think it could went to some one else who enter on it. House #2, at the minimum paint the downspouts same color as shutters/garage door. Fresh mulch, fresh trench between turf/bed lines. Stain deck 2 tones darker than shutters/garage door. Remove items from front/back doors. Curb appeal of this house is truly better than shown. A lovely home. House #5, wish I were the lucky buyer ! House is too big but the land is perfect. Of course we all want THE beach house. 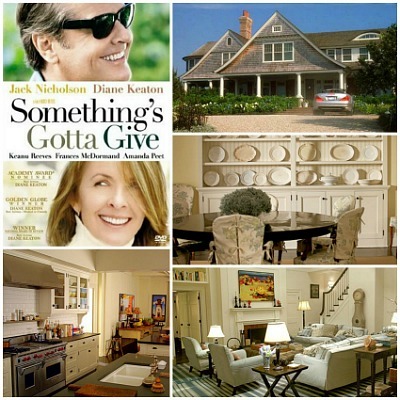 I’m with you – definitely the “Something’s Gotta Give” house. Fantastic. And while it may not be quite as perfect as the movie version, I bet it’s pretty great. If I can’t have that I’ll take the stone house in Indiana. It would be fantastic with a little work – pulled up carpet, stripped wallpaper, and a little paint. I was disappointed with the Birmingham house. It looked so fab on the outside but was kind of cold and sterile on the inside. 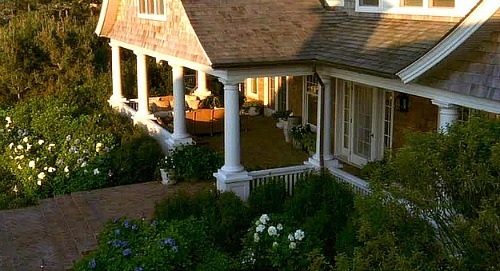 I think if someone gave me Trisha Yearwood and Garth Brooks’ Malibu house I could shabby chic-ify it and make do! I love love LOVE Garth Brooks/Trisha Yearwood’s Malibu beach house. It’s absolutely perfect. Love, love, love number three but it makes me sad b/c they have let the house, yard and pool go. Plus, there is a lot going on w/ their belongings and the house does not show as well as it could. Loved how they included original photos of the house at the end. I liked that they showed the old b&w photos of the house in the listing, too. So cool! You really do get a better idea of how big it is from that aerial view, don’t you? Not to mention the price tag ($41m, gulp). I know, the house prices in Indiana are amazing. We got totally spoiled when we lived there, and it was kind of a shock when we moved away. I wish they would do giveaways in some urban areas like NYC, Minneapolis or Boston. I am thinking more lofts/condo type deals. I think it might be easier to rent and keep the property then, but who knows with this crazy real estate market! I get the feeling they keep house prices high in the Hamptons to keep us non-billionaires out. And it’s working! Ha. Love your blog… I love to see great houses. Somethings Gotta Give movie house was one of those! I think our old beach house in SoCAl was the teeny version of that house! It just takes the right $change! Thankyou for sharing your love for houses.. The SGG house is the yardstick, the dream, the holy grail. All other houses should bow down. I bought the DVD to look at the house. I once lived near Chesterfield, Missouri, and did not know that this house even existed! I’ve toured several Frank Lloyd Wright houses in the last year, and this home definitely has the feel of a FLW. It was stunning. And to have the views of Chesterfield Valley? Priceless! Of course, it’s hot and humid three quarters of the year in St. Louis area, so you would only be able to enjoy the outdoors from looking out the windows! LOL! My son is currently designing houses, and if he could, I think he would design one to look just like this. Did I mention that he is a Minecraft architect and only ten years old? The future FLWs have to start somewhere! West Count St. Louis was a beautiful place to live, and I’d go back in a heartbeat, humidity and all. It definitely gets hot and humid there. I have family in the area and spent a few sweaty summers there as a kid. Ha. I wish I know how to find houses like this to buy. I would love to buy and older home near me and re-claim it. Do you have any suggestions for this information? I’d say check your local real estate listings at least once a week and keep up with what comes on the market. Or find a real estate agent who can keep an eye out for you! Such a beautiful house with attractive plants and trees that acts like a fence. The design, which have used in this house is really inspiring. Gorgeous landscaping. Beach house is absolutely perfect where you can enjoy the outdoors from looking out the windows. I think this an ideal house for me. Thanks for sharing your innovative ideas & design.